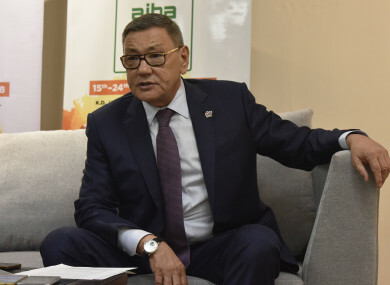 GAFUR RAKHIMOV HAS stepped down as head of the AIBA, world amateur boxing’s governing body, amid a spat with the International Olympic Committee, who welcomed the move as they mull the status of boxing at the 2020 Tokyo Games. The status of boxing is on the agenda for IOC executive board meeting in Lausanne next week, from 26-28 March. Therefore, given the current situation, I have informed the AIBA committee of my intent to step aside as AIBA president. Email “Hope for Olympic boxing as AIBA chief 'linked to transnational criminal organisations' steps down”. Feedback on “Hope for Olympic boxing as AIBA chief 'linked to transnational criminal organisations' steps down”.